How many pieces does a heart have? When it breaks, do the pieces run out or grow back? Are they like a cat's lives or crab's claws? I've left pieces of my heart in places that I've loved and that have meaning to me. A piece of my heart will forever live in NYC. Pieces live in Fort Phoenix, Hawaii, and the Chili's in Dedham. Several pieces live in memories that visit from time to time through a song, a smell, or an ocean breeze. There are pieces I had no choice but to lose. They now live with friends whose paths have diverged from mine to places like Chapel Hill, Ithaca, Seattle, etc. I imagine I've taken pieces of others' hearts, too, in my moves from CT to NY to NJ back to CT and to MA (so far). While I never had my heart broken by a significant other, there are pieces that have been stolen or broken by those who I thought were my friends. Some have been given to those who have passed away. My grandfather. My grandmother. My Auntie Sue. My 11-year old cousin. There's a piece, of course, for CDG which radiates light, heat, and waves inside of me. There's a piece that feels warmth when I make my mom smile. There's a piece that currently exists for Roxy and the piece I feel tearing away every time she shows some sign of aging. There's a piece that feels proud of myself for the things I'm confident about. There's a piece that cringes at my insecurities and anxieties. 2017 has me constantly feeling these pieces stronger than I've felt them in years. This year has been filled with beginnings and endings. Pieces have fallen off, been given away, and been taken. I'm gaining new pieces and continuing to express my gratitude for the ones that haven't budged. How many pieces does a heart have? Infinite. I'm going to keep giving them away. 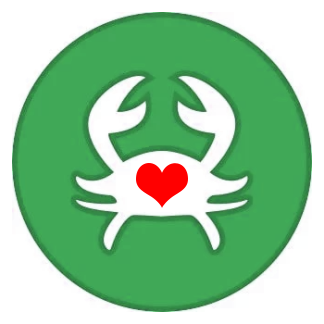 I'm a Cancer, the crab, ruled by the moon. I will retreat into my shell sometimes. I will sit by the water. I sure as hell will regenerate new pieces.